MoBikeFed President's Editorial: ATVs on the Katy Trail? 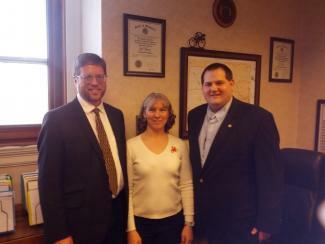 Rachel visiting with Rep. Bart Korman, sponsor of the bill to ban cyclists from many Missouri highways. Monday, Rachel was one of the few who testified against HB 2074 in Committee that sees the bill in a very favorable light. Have you walked or bicycled on the Katy Trail? Metallic blue indigo buntings and yellow finches dart in front of you. The tunnel of trees shades you from the hot sun. The river flows nearby, and little streams nearby gurgle happily. It is peaceful and happy, until you hear a loud motor. The sound gets louder and before you've figured out where it's coming from, an ATV zooms past you, hogging the trail and raising a cloud of dust and fumes. You lose your balance and land in the ditch. Oh, has that never happened to you? That's because ATVs are not allowed on the Katy Trail State Park, a 240-mile rail to trail conversion stretching across Missouri—still the nation’s longest rail-trail. HB2047, introduced by Missouri State Representative Jay Houghton of Martinsburg, would allow ATVs and golf carts on the Katy Trail on the 1st and 3rd Wednesday of each month for people 55 and older and people with disabilities. People with disabilities already may use motorized mobility devices on the Katy Trail (including, on a case-by-case basis, golf carts). But age alone is not a disability. When I'm on the Katy Trail, many if not most other users are over 55 years old. They are walking and bicycling, and they love it. And for people who want to enjoy the Katy Trail without walking or bicycling, State Parks already operates a tram service out of Booneville. The Katy Trail is a Missouri treasure. Every year, hundreds of thousands of people walk or bicycle on the Katy Trail. They come from down the street, they come from all over Missouri, all over the nation, even all over the world. They like to walk and bicycle on the Katy Trail because they don't have to worry about traffic. For many, the Katy Trail is the only place around here that they can bicycle--they are scared to bicycle on roads. Adding ATVs to the mix would mean those people wouldn't bike at all. Allowing ATVs and golf carts on the Katy Trail will cost money. The Katy Trail was designed for walking and bicycling. It is 8 to 10 feet wide--not wide enough for ATVs and golf carts to safely pass people walking and bicycling. To allow ATVs and golf carts to safely intermix with people who walk and bicycle, we will have to reconstruct the Katy Trail. ATVs tear up trails, so trail maintenance will increase. The additional traffic will require additional rangers to patrol--making sure that the ATV users are 55 and older or disabled, that they don't go off trail into private farms and fields, and that they obey the speed limit. Do we want ATVs on Missouri's Katy Trail? Besides ruining the peace and serenity of the Katy Trail, what will be the economic impact of the bill? The Katy Trail adds $18 million dollars annually to the economy of trail communities. Every $1 spent on the Katy Trail brings in $18 dollars in return. But people visit the Katy Trail and value it precisely because it is quiet, peaceful, and away from motorized traffic. The trail is a chance to reconnect with nature and find some solitude. A disruption to tourism will put many bed & breakfasts and cafes that cater to trail users out of business. There are legal implications for this too, which could be complex and costly. Creation of the Katy Trail was itself a tortuous legal battle that went all the way to the United States Supreme Court. The resulting agreement compensated adjacent landowners for conversion of the corridor from a railroad to use as a nonmotorized trail. These agreements, and potentially millions of dollars of additional compensation, will be at risk if we change the nature of the trail. I want everyone to be able to enjoy the Katy Trail. Some can bicycle, some can walk--and those who can’t bicycle or walk are already allowed to use mobility devices on the Katy Trail. Please contact your state representatives and senators and tell them that you love the Katy Trail without ATVs. Plan to join us for Bicycle and Pedestrian Day at the Capitol April 11th, 2016 to discuss this and other issues with our state legislators. Rachel Ruhlen is the president of the Missouri Bicycle & Pedestrian Federation. 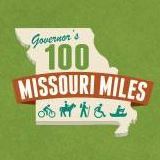 Working to create a world-class bicycle and pedestrian transportation system in Missouri, protecting the system we have, and improving safety for those who walk and bicycle are among the top priorities of MoBikeFed's Vision for Bicycling and Walking in Missouri. 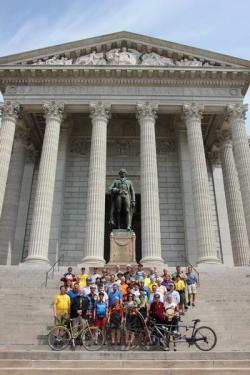 Your ongoing membership and generous financial support helps our Vision become reality--and helps us defend Missouri trails at the state capitol and in Congress.